Muay Thai is a martial art that originated in Thailand and has since spread in various forms internationally. 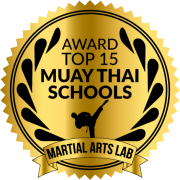 We offer a more boxing-heavy style of Muay Thai that is similar to Dutch-style kickboxing as seen in organizations like K-1 and Glory. Muay Thai is a martial art that uses punches, elbows, knees, kicks and standing grappling (clinch).